This book, a collection of the speeches and writings the author has given over the years , captures and explains the thinking of Singapore's foreign policy very well. He shows good insight into the dynamics and issues of regional politics and the world issues he selects to comment on, often with a refreshing perspective. As Mr George Yeo, a former foreign minister, said: " You may not always agree with Bilahari, but you cannot dismiss his views lightly." He is one of the best minds the foreign service has produced. The strength of the essays is in the sharpness he brings to tackling the fundamental existential questions of Singapore and the frankness with which he addresses its dilemmas. I would however argue that not all Singapore's diplomats practise foreign policy with the same degree of cynicism articulated by Bilahari. I know in one of the first essays, Bilahari urges young people to look at uncertainty with a pragmatic scepticism, not cynicism. I agree. But when you are too sceptical, you become an ideological sceptic. Then, the line between the sceptic and the cynic disappears. The point is, when one is too sceptical or cynical, one can miss opportunities in diplomacy and foreign policy, in business , in life. Realism yes, scepticism yes, cynicism sometimes. Some even cherish idealism. We must know how to channel the idealism. I will begin by expanding on the inescapable truths that shape Singapore's foreign policy which Bilahari underscores. Foreign policy begins with working with the reality and origins of independent Singapore: a Chinese-majority state in South-east Asia , in the Malay Archipelago. We were born out of conflict in a region of war - separation, Confrontation and the Vietnam War. For survival in the region, Mr Lee Kuan Yew and the first generation of leaders picked policies deliberately to ensure we would not be seen as a "Third China". We would have been the lightning rod for attack. Fifty years on, we are in the same location and the realities have not changed. Ethnicity remains an issue in Malaysia and Indonesia, and you can see it resurging in the world. Ethnicity never disappears. It can be dormant, it can wax, and becomes salient when triggered. Ethnic politics is ugly; religious politics is dangerous. There is always the possibility of contagious influence. Singapore has built a multiracial, multicultural and multilingual society. This multiracialism has been what distinguishes Singapore from other countries. To have three-quarters of the population of one ethnic group and yet have the majority Chinese give up its claims to majoritarianism and accept multiculturalism because Singapore is located in South-east Asia was an act of political genius. It is not a multiculturalism that just tolerates other ethnic groups, but where each group is accorded equal recognition and status. Singapore's foreign policy was, and still remains, one of protecting its sovereignty and identity as a small state and a multiracial state. They are goals we cannot take for granted. We have seen at least three spectacular examples in recent memory - Vietnam's invasion of Cambodia, Iraq's invasion of Kuwait and, more recently, the de facto blockades against Qatar by seven countries in the Middle East. The nature of our state is something we have to keep explaining to others, including China, where at some levels we are referred to as a "Chinese country". And with the increasing influence of Chinese soft power and economic hard power, Singapore will, through its policy, seek to emphasise the Singaporeaness of our identity and sovereignty. Mr Lee Kuan Yew made a point of it in the early days of nationhood. We are now also making a point of it because of rising China. It is not evidence of unfriendliness. It is simply a reaffirmation of a national identity that is still in the making and our distinctiveness. What are the fundamentals of our foreign policy? Singapore's foreign policy is one based on principles, is pragmatic and consistent. We must base our foreign policy on principles. That is obvious. We need principles to guide us as we make our way through the complex and, sometimes, treacherous world of international politics. Our foreign policy is based on the principles of the United Nations Charter and international law and norms, Unclos (UN Convention on the Law of the Sea), the rules of the World Trade Organisation, the rule of law. It is especially pertinent to small states. We have a sense of what we must do to survive and protect ourselves. I believe our foreign policy must be guided by a set of principles, but we should not highlight it in every speech we make, to say we have a "principled" foreign policy. We can make the point now and again, but it is for others to see our actions and conclude we have a "principled" foreign policy. Our foreign policy should be based on principles, but we should not be ideological about it. Similarly with consistency. We should not keep repeating we have a consistent foreign policy. I agree with Bilahari when he said in his essay, Seeking Security Through Diplomacy, that: "Consistency is only possible at such a high level of generality as to be practically useless. A foolish consistency can, in fact, be harmful." We are also realists and there would be times when a country would have to weigh its strategic interests against its principles or values. In the US , we know there are realists who see strategic interests as more important than values in some circumstances in US foreign policy. This is clearly so with human rights and working with authoritarian regimes. When it is in the strategic interest of the US to work with a country that does not have a good human rights record, they conveniently overlook it. Our foreign policy over the last 50 years has served us well. We became independent during the Cold War era. We chose to be non-aligned, but pro-West. In the post-Cold War period, like many countries, we had to adjust to the US hegemonic moment and to the Western triumphalist push for democracy and human rights. You will recall our attempts to push back with Asian values. We welcomed the US security presence and economic presence, but saw the promotion of democracy as a new cultural imperialism. We worked through Asean and other countries in the region to ensure the US stayed in the region and that an emerging China would be integrated into the regional institutions, and, importantly, that the US and China would be able to engage with each other in one forum. I believe everyone in the region, including Australia, New Zealand and Japan, thought this was a good strategic move. But in the last two decades, the world has changed. When I arrived in Washington in 1996, the US was enjoying its unipolar moment and Americans were full of confidence. I remember I sat in on a strategic futures exercise on the eve of the millennium, run by a Department of Defence think-tank, and we - there were a handful of foreigners - were asked what were the certainties we could think of in the 21st century. We had to type in a line. Many Americans typed in " US will remain the hegemonic power in the 21st century", "America will remain a superpower". And others, "Technology will be king", a few statements on science. I waited. There was nothing about China. I typed in "China will emerge as a great power in the 21st century". There were a couple of other statements reflecting this thought by the time I finished. But not many. By the time I left the US in 2012 at the end of my tour, the US had changed from a confident power to one of self-doubt. Bear Stearns had happened, (so had) Lehman Brothers, and America had plunged into a deep recession. There were so many books published on declinism in the US. I never bought into that thesis. The US is a far more resilient power than that and highly creative. There have also been many periods in history when the US was down and ended up rebounding. Well, today, the US economy has recovered some. The stock market has done exceedingly well, whether it is fully because of the "Trump effect" or not. China has emerged as a formidable economic power and is the second largest economy in the world. Brexit happened. The election of Mr Donald Trump as President of the US has infused greater unpredictability about US commitment to global leadership. I believe we are seeing the beginnings of the post-America world. I am not saying the US will not remain a superpower. It will. But it seems no longer interested in leading the world as it once did during the 20th century. Former US president Barack Obama believed in leading from behind, and the "Syrian red line" showed to be no red line - which disappointed many allies and friends looking to US leadership. President Trump has asserted "America First", rejected globalisation, the TPP (Trans-Pacific Partnership) and the Paris (climate change) Agreement, and has belatedly recommitted the US to Article 5 of the Nato agreement. Significantly, German Chancellor (Angela)Merkel, in a campaign rally after the Nato summit in May, said: "The times in which we could completely depend on others are, to a certain extent, over." What is concerning is that we can make sense of the Trump phenomenon if we see him as a culmination of much bigger social and economic trends and that he reflects bigger cultural and social dynamics, as Naomi Klein said in her recent book, No Is Not Enough, on populism in the world. In a recent lecture, Mr Peter Ho (former head of civil service) spoke of the great disruption that we are seeing today with the rapid advancement in technology, the change in the bases of economies and how borders are breaking down. I buy into that thesis. What this means is that one must be agile and nimble and think with the times. It may be necessary for us in this new world to re-examine how we do business and the sets of relationships that we have. So, the question is, how do we apply our principles in the new world and do we need to re-examine some of these basic principles? • Professor Chan Heng Chee is chairman of the Lee Kuan Yew Centre for Innovative Cities at the Singapore University of Technology and Design. Earlier this spring, I found myself walking through Lower Manhattan. There was still a chill in the air; a few flakes of snow had fallen the night before but nothing had settled. As I wandered, I was interested to see whether there were any residual signs of Hurricane Sandy, which had struck the island on 29 October last year, battering the Five Boroughs remorselessly and serving as unnerving reminder of the fragility of the city. That October night, as the waters rose and started to fill Lower Manhattan, there was proof that not even Wall Street was beyond the reach of nature. And as the lights went out — and stayed out for days afterwards — there was a strange feeling of the possibilities of this happening more often, anywhere in the world. Elsewhere in the darkened city, the infrastructure was down. The subway system was flooded. Cars picked up by the rising waters were scattered and dumped like flotsam. In Staten Island, whole neighbourhoods were flattened, while, in Queens, an exploding generator set a fire raging across several blocks. To add to the physical damage were stories of human woe: 300 patients from New York University’s Langone Medical Center had to be sent outdoors when high winds knocked out the emergency power. In Staten Island, a young policeman drowned after leading his family of six adults and a 15-month-old baby to safety, and two boys aged two and four died after being ripped from the arms of their mother, Glenda Moore, as she tried to flee the rising waters in her car. She’d gone in search for help, but nearby residents had refused to open their doors. Hurricane Sandy raises big questions about how we will live in the future. A city mayor, even one as optimistic as New York’s Michael Bloomberg, cannot stand up amid the wreckage and tell people that everything is fine, that it will never happen again. Today we face an ecological challenge of our own making: now that the majority of us live in cities, it is within the metropolis that our future salvation or death warrant will be drafted. For some geographers the future looks bleak. According to Matthew Kahn, professor of economics at the University of California, Los Angeles, and the author of Climatopolis: How Our Cities Will Thrive in the Hotter Future (2010), climate change will have serious consequences for many major cities. As the polar ice cap melts, coastal settlements will be first to feel the flood. San Francisco, London, Rio de Janeiro and New York will all be hit when the waters rise and swamp the lower-lying (and often poorest) communities. San Diego in southern California is especially vulnerable: by 2050, the sea level will be approximately 30-45 cm higher, and temperatures will have risen by an estimated 4.5 degrees. Meanwhile the city will have continued to grow, bringing with it an increased demand for services, including a 35 per cent rise in demands for water. At the same time, and despite rising sea levels, the Colorado River will shrink by around 20 per cent, upping the threat of wildfires in San Diego’s hot, dry hinterlands. Kahn predicts that the city’s population will skew towards the elderly because the young will have a better chance to leave: when the waters rise, society’s most vulnerable will be on the front line. We do not, however, need to rely on speculation to imagine the impact of extreme weather events on the city. We have seen this scenario unfold before. Overheated Chicagoans opened an estimated 3,000 fire hydrants, leading to record water use. The Chicago Park District curtailed programs to keep children from exerting themselves in the heat. Swimming pools were packed, while some sought relief in cool basements. People attended baseball games with wet towels on their heads. Roads buckled and some drawbridges had to be hosed down to close properly. Only once the worst of the heatwave had passed were authorities able to audit the damage. More than 739 people died from heat exhaustion, dehydration, or kidney failure, despite warnings from meteorologists that dangerous weather was on its way. Hospitals found it impossible to cope. In a vain attempt to help, one owner of a meatpacking firm offered one of his refrigeration trucks to store the dead; it was so quickly filled with the bodies of the poor, infirm and elderly that he had to send eight more vehicles. Afterwards, the autopsies told a grim, predictable tale: the majority of the dead were old people who had run out of water, or had been stuck in overheated apartments, abandoned by their neighbours. In response to the crisis, a team from the US Centers for Disease Control and Prevention (CDC) scoured the city for the causes of such a high number of deaths, hoping to prevent a similar disaster elsewhere. The results were predictable: the people who died had failed to find assistance or refuge. They had died on their own, without help. In effect, the report blamed the dead for their failure to leave their apartments, ensure that they had enough water, or check that the air conditioning was working. These two scenarios offer a bleak condemnation of our urban future. Natural disasters appear to be inevitable, and yet we seem largely incapable of readying ourselves for the unexpected. What can we do to prepare, and perhaps prevent, coming catastrophe? New York, 2012, and Chicago, 1995, offer alternative reactions to the same dilemma. For New Yorkers, it seems, the response to climate change is a mechanical one. Architects, planners and engineers are currently looking at ways to stop the rising tides and reduce the damage of hurricane conditions. This has already produced a number of innovations, such as the proposal by the Hudson River Foundation and the US Army Corps of Engineers to lay new oyster beds and stabilise the coastline along the Hudson River; and the large-scale scheme initiated by Mayor Bloomberg to create a storm surge barrier across the mouth of New York Harbour. In the meantime, the Federal Emergency Management Agency (FEMA) has produced flood maps of Manhattan and the surrounding boroughs, charting those neighbourhoods vulnerable to rising waters. In part, it comes down to money. Following the hurricane, the damage was quickly audited and found to have cost the city $19 billion ($60 billion, if you include the federal recovery package). This, it seems, is a price worth paying for the benefits of living in the city. There have been no stories of mass evacuations, or of families moving away for a quieter life. In addition, the city has been quick to announce that it’s prepared to cover whatever it costs to protect the metropolis in the future. This raises a disquieting question: will there ever be a time when the price for safety in Manhattan gets too high? After the heatwave of 1995, Chicagoans opted for another way of dealing with disaster. On the back of the CDC report and independently of the official scientists, Eric Klinenberg, a professor of sociology at New York University, conducted his own research on the heatwave and focussed on the districts worst hit by the disaster rather than on the behaviours of individuals. His findings, published as Heat Wave: A Social Autopsy of Disaster in Chicago (2002), put an emphasis on neighbourhood failures rather than individual folly. Klinenberg found that there were 40 deaths per 100,000 people in the North Lawndale neighbourhood, while in South Lawndale there were only four deaths per 100,000. North Lawndale was a community in decline; it had nowhere for old people to go, no shops, gathering places, or parks. There was no functioning community to look out for the most vulnerable in times of trouble. The failures of the district had been a long-term problem and could be charted systematically: North Lawndale had lost many residents to the suburbs, and their numbers had not been replenished. By contrast, South Lawndale was a thriving community, its streets bustling with people, its churches offering a range of social activities for seniors. By studying the community as a whole, Klinenberg’s research raised interesting questions about how disasters affect a city. In particular, he challenged the idea that a city’s robustness can be judged on the built environment alone. When so much discussion around cities concerns the bricks and mortar, roads and infrastructure, it is easy to forget that cities are made out of people who live and thrive in the spaces between buildings. Klinenberg argued that the robust community was as essential a defence against disaster as any engineering solution, and that social solutions to disaster are ones that politicians and planners ignore at their peril. Disasters are complex things that, after the event, can be read in many different ways. But since the predictably unpredictable occurrence – the so-called ‘black swan event’– has now become an inevitability, many urban planners and environmental scientists have started to discuss the fragility of the city as an urgent issue. The idea of a city being ‘fragile’ might seem ridiculous – the wrong metaphor for the metropolis. But in Antifragile: Things That Gain from Disorder (2012), former Wall Street trader Nassim Nicholas Taleb builds on The Black Swan (2007), his earlier ground-breaking book, which examined the potentially devastating power of unexpected events. Taleb proposes a way of measuring the world that designates organisations, cities, communities and businesses as ‘fragile’ or ‘anti-fragile’. Anything that survives (and thrives) through adversity is non-fragile: it has ‘the singular property of allowing us to deal with the unknown, to do things without understanding them — and to do them well’. If we cannot predict what’s around the corner, Taleb argues, we must at least be ready for any eventuality. We must, in other words, cultivate resilience. The term ‘resilience theory’ was coined in the early 1970s by the Canadian ecologist C S ‘Buzz’ Holling who was fascinated by the relationship between ecology and complexity. Looking at models of how things change, Holling hoped to find the hidden laws that underpin disturbance – whether out of the blue, like fires or explosions, or occurring more slowly, while being similarly transformative. As Taleb would later do, Holling attempted to measure resilience as a quality. For example, he suggested that robustness could be judged by the amount of time it takes for an equilibrium to recover, or else on the strength of its rigidity — ‘the capacity of a system to absorb disturbance and reorganise while undergoing change so as to still retain essentially the same function, structure, identity, and feedbacks’. He nominated four key factors that underpin resilience: latitude, or, how far the system can be attacked; resistance, or, the rigidity of the structure to resist change; precariousness, or, the fragility of the current state of the system; and finally panarchy, which refers to the degree to which different systems connect and interact. Under the seeming disorder of the old city, wherever the old city is working successfully, is a marvelous order for maintaining the safety of the streets and the freedom of the city. It is a complex order…composed of movement and change, and although it is life, not art, we may fancifully call it the art of the city and liken it to the dance. In addition to a growing understanding of the city as an expression of complexity, it is now increasingly common to study the metropolis as an ecosystem, in which, most obviously, the city is on the frontline of the climate change debate. As such, it is an urgent testing ground for ideas about resilience, even if the urgency presents a tension between human and ecological concerns. Cities are where most people live: in 2007, the United Nations announced that by the end of 2008 more than 50 per cent of the world’s population would be urban, rising to 75 per cent by 2050. Yet cities are also where the vast majority of the world’s energy resources are burned up. For example, New York generates more greenhouse gases per square foot, uses more energy, and produces more waste than any other place in America of a comparable size. It may be a relief to realise that, counter-intuitively, living in the city is perhaps greener than many imagine. Despite the statistics above, New Yorkers individually are more energy efficient, emit less carbon and produce less waste than the average person outside the city. In 2009, the New Yorker journalist David Owen revealed the astonishing truth that living in New York was a more environmentally friendly lifestyle than living in the suburbs or even the countryside. He showed that contrary to most assumptions, when people live in close proximity to each other, in a walkable environment, they actually become far more environmentally efficient. Despite the heavy energy usage and the costs of transportation within the city, it is nonetheless a remarkably smart way of gathering people together. Whether the city becomes our ark rather than our concrete coffin is up to us. Most urban thinkers view planning for a resilient city as either a political or a technical conundrum – a matter of top-down diktat (a kind of austerity drive writ large), or else a frenzy of innovation that will help us use less energy, live more efficiently, prepare and protect us from the next black swan. But increasingly they feel there is more robustness to be gained from investing in smart, small-scale, communications-oriented solutions rather than mammoth building projects. Flood controls such as the Thames Barrier in London, and the MOSE system of barriers across the Venice lagoon, have their role to play; but resilience is less about brute resistance than about staying one step ahead of disaster, using smart-tech avoidance mechanisms. Already internet technology and big data is aiding resilience. Google has modelled sophisticated means for tracking the spread of flu by charting search results from its engines, while the Twitter Earthquake Detector has been used to link seismometers to social media to assess the scale and impact of a tremor. Other big players, including IBM, Cisco, Siemens, Accenture, McKinsey, and Booz Allen are entering the debate on the intelligent city and developing tools to bring efficiency and sustainability into a connected metropolis. They are talking to city halls and offering end-to-end solutions — the complete package to retrofit the everyday city for the 21st century, coupled to a very hard sell. In one scenario, the city itself becomes the computer, in keeping with the rules of the information age. In this new, connected city, real-time information monitors and regulates the urban fabric, deploying buildings, objects and traffic lights as sensors and activators. In the words of Carlo Ratti, Director of the SENSEable City Lab at MIT, it will function like ‘a computer in the open air’. A sentient place, the city will not just gather information but change and react to feedback. Commenting on these developments without any apparent sense of irony, Assaf Biderman, The SENSEable City Lab’s Associate Director, says that smart technologies can make ‘cities more human’. The SENSEable City Lab is at the forefront of developing a number of tools to help us navigate the city. Take the Copenhagen Wheel (first used on bicycles in the Danish capital in 2009) – a device that both recycles the energy generated through pedal power, and also contains sophisticated sensors that can be used to inform the rider about oncoming traffic, the condition of the roads or the best route around a diversion. Since 2011, SENSEable City Lab scientists have also been testing an open platform that pools all the information generated and needed by the city-state of Singapore. ‘LIVE Singapore!’ taps data from various government departments to produce a real-time data feed of everything going on in the city, which can be accessed on multiple devices by politicians, traffic police and ordinary citizens. The project already boasts an isochronic map that shows how long it takes to move about Singapore at various times of day. The data feed can also improve the distribution of taxis around the city, and model how big events such as the Singapore Formula One Grand Prix might disrupt city infrastructure. In the humanised city envisaged by scientists and planners, we will live in smart buildings and drive smart cars. Data will be collected every time we use public transport, as London’s Oyster Card system does now. Our cars will be able to alert the garage to report a fault. In fact, Mercedes-Benz has already equipped its 2013 models with a telematic system that communicates in this way and that upgrades its software on the move. Most cities already have traffic lights rigged with sensors that detect congestion and traffic flow; and most modern office blocks are now smart buildings that can regulate internal temperature and lighting automatically. Meanwhile, face recognition software, while unreliable at present, might one day be used for everything from banking to security. All these innovations exploit the link between robustness and sustainability, helping us reduce energy use, better utilise our resources, and build better homes. In contrast to future-proofing existing cities, some urban theorists are excited by the possibility of starting all over again. Masdar City, designed by the leading British architect Sir Norman Foster in the desert outside Abu Dhabi, is currently being built by the Abu Dhabi Future Energy Company. Foster has always pioneered technical solutions to questions of sustainability, investing in new materials and in designs that reduce energy use, while always remaining visually innovative. At Masdar, he takes the idea of the sustainable city to its current limits. 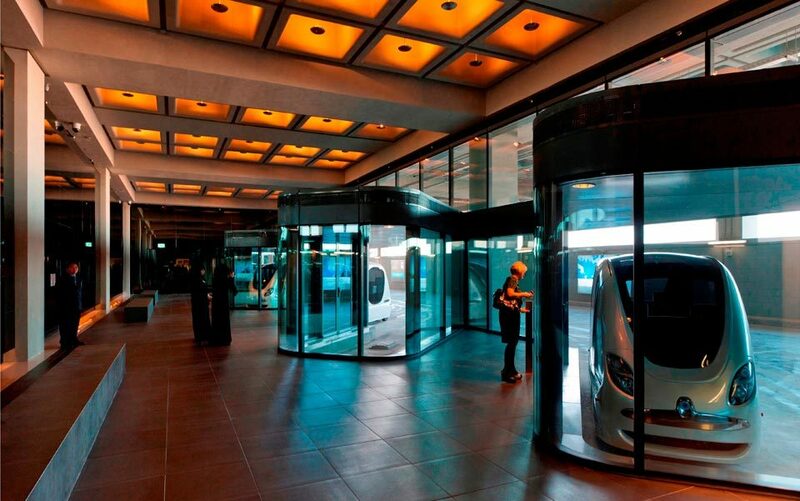 Future shock: Masdar City’s PRT (Personal Rapid Transit) station. Masdar is being built over 17 sq km, with ambitions to be a zero-carbon environment — the epitome of cutting-edge sustainable design. Phase One of the build sits upon a raised base so as to benefit from desert breezes, which create a natural cooling system. There’s argon gas insulation between the rammed earth and the buildings’ steel walls, and photovoltaic piles outside the city to generate energy. One of Foster’s most futuristic ideas are the driverless personal rapid transport pods that run along rails through the underground level of the city. This allows for a tighter street grid, which once again helps keep the ground level shady and cool. Despite their dazzle, many of the gleaming innovations discussed here suffer from a problem that cyber critic Evgeny Morozov, author of The Net Delusion (2011), calls the ‘solutionism’ of the Information Age — the prophetic notion that, if it were only allowed to do so, technology could deliver complete answers to our every problem. But it is not that simple. Resilience in the face of natural disasters is more than just a technical aspiration: it is a social one. As recent climate change summits in Kyoto, Copenhagen, and Rio have shown, the level of trust between nations to put environmental standards before profit is very low. Which perhaps suggests that it’s not nations but cities — already the locus of where the future will be won — that might be the engines of change. Cities can organise themselves, and among themselves. The C40 group of cities – created in 2005 to unite leading world centres in combatting climate change – has now published its goals and projections for reducing carbon emissions: Buenos Aires aims to reduce emissions by a third by 2030; Madrid, to halve them by 2050; while Chicago hopes to slash emissions by 80 per cent by 2050. In addition to carbon emissions, the C40 group highlights eight key areas to prioritise — building, energy, lighting, ports, renewables, transport, waste and water — and its members are calling for radical solutions. So far, responses have been diverse. In the US, San Francisco has begun planning the largest city-owned solar-power station in the world. In Norway, Oslo has introduced 10,000 ‘intelligent’ street lamps that have cut energy consumption by 70 per cent and saved 1,440 tons of CO² for each year of operation since 2004. In South Africa, the Emfuleni city authorities have installed a citywide water efficiency system that has reduced the pressure within the network, thus reducing costly leakages. All this is proof, at least, that city governments acknowledge the issues and are searching for interesting solutions, regardless of national policy. In 2012, the British government released its own document on resilience. The UK Climate Change Risk Assessment covers all areas of threat, including agriculture, business, health, coastal erosion, transport and the built environment, acknowledging that the major threats to Britain’s cities are flooding, overheating, subsidence and the urban heat-island effect, which causes inner cities to be two or three degrees hotter than surrounding rural areas. What the report makes clear is that the city faces not a single threat, but a complex combination of concerns that defy any single solution. Our infrastructure is so knotted that energy, water, waste management, transport, and information and communications technology are inseparable. Since Hurricane Sandy, Mayor Bloomberg has set up an Office of Policy and Strategic Planning (dubbed, by the New York Times, the office of ‘New Yorkology’), which is using big data to help the city run more efficiently. The team has gathered vast quantities of data about the 8 million citizens within the Five Boroughs, using information archived in the city’s data store, as well as information from millions of calls to the 311 phone line - from complaints about noise, parking analysis, housing problems, to real time subway information - to make better policy decisions, and allocate resources when and where they are most needed. This move comes on top of Bloomberg’s ‘Greener, Greater Buildings’ programme, launched last May to retrofit the city’s existing buildings so that they emit as little carbon as possible. Both schemes covertly assert New York’s independence, suggesting that the city — with its very different needs and challenges — sets its own agenda and standards. Mayors, it seems, have worked out that green and pleasant cities boost popularity, making people to want to visit, work and live there. Not least, the environmentally friendly city is one that addresses the problems of resilience, because in promoting sustainability it enhances community. But is this enough? In spite of Mayor Bloomberg’s pre-Hurricane Sandy measures, whereby 25 city agencies set a focussed agenda for the Five Boroughs that covered every aspect of New York, from housing, parks, water, waste and air quality, to how New York could remain competitive in a global marketplace, the waters still rose. And what became clear in the aftermath was that the disaster was different for different people. It underscored the gulf between the haves and the have-nots. Where some experienced the rising waters as little less than a hindrance, others had their lives devastated. The day after the disaster, joggers ran their usual route round Central Park, while activists working under the banner of ‘Occupy Sandy’ were busy forming rescue and construction teams to help in the flattened areas of Staten Island. Politicians and engineers rarely talk about trust when discussing the creation of a robust community, perhaps because we are constantly being told that trust is a busted currency. Recent polls suggest that our levels of trust in politicians, journalists, lawyers, and police are in decline, and that society is fragmenting as a result. But that is just one definition of trust; it fails to embrace how trust governs our lives, tempers our dealings with one another, and is the glue that keeps our cities together. We might no longer trust politicians but we do still trust. This kind of trust often emerges in unexpected situations, prompting us to rethink what actually happens during moments of disaster. In A Paradise Built in Hell (2009), written after Hurricane Katrina broke the levees and flooded New Orleans in 2005, the writer and cultural critic Rebecca Solnit looked at the spontaneous proliferation of cooperation amid calamity. ‘When all the ordinary divides and patterns are shattered,’ she wrote, ‘people step up — not all, but the great preponderance — to become their brother’s keeper’. In a series of case studies spanning the San Francisco earthquake of 1906, to Katrina in 2005, Solnit cites numerous instances of communality in adversity. One example: as hundreds of people, post-Katrina, were left abandoned and in desperate straits, it was not the officials, police or even FEMA that assumed control, searching out the most needy. Quite the reverse. As President George W Bush circled above the flood zone in Air Force One, the authorities were fully armed and spreading stories of rampaging looters and rapists. Meanwhile, ordinary citizens braved the floodwaters, using canoes to ferry their neighbours to safety, and rescuing abandoned pets; while eight doctors and 30 nurses remained behind in New Orleans’s flooded City Jail to tend to vulnerable prisoners. Yet such resilience-building trust cannot be taken for granted: it ebbs and flows with the levels of inequality found within a community. And inequality destroys trust. It has become a truism to note that our cities are blindingly unequal. Cities are where you find the super-rich and the long-term impoverished crammed together side by side. They are where wealth is made, and poverty both prevalent and hidden. In London, for example, the richest 10 per cent of the city is 850 times wealthier than the bottom 10 per cent. What hope has elective trust of thriving in such an environment? And what hope disaster planning, given that most disasters hit cities disproportionately, and that the poorest and most precarious groups suffer hardest? In the wake of Hurricane Sandy, there has been little discussion of the social lessons of the disaster, as opposed to the latest smart solutions. Most tellingly, FEMA’s map of the vulnerable neighbourhoods showed that, Lower Manhattan aside, the most affected areas were also the poorest ones, least able to protect themselves. With insurance premiums rising in these areas, and with those who can moving away, these communities will become increasingly precarious. Arguably, the most interesting post-hurricane statistics were gathered by Occupydata NYC, the activist group behind the Occupy Sandy relief effort: more that 3400 volunteers turned up to help in the days after the flooding; 27,000 meals were served from makeshift relief kitchens; 60 households opened up their homes to help the newly homeless; a motor pool was created to transport aid to where it was needed; and teams of helpers dispersed across Staten Island to help with repairs. The group soon became essential to the relief administration, often working faster than the city government itself. This example reminds us of the dangers of judging the robustness of a city by how well the buildings stand up against the wind and the waves, or whether the trains and planes keep on schedule. These things are important for the normal running of a city, but they do not unlock the key to resilience. If we plan on building resilience and disaster-proofing the metropolises of the future, then we have to think just as hard about tackling inequality and augmenting the social strength of the community as we do about engineering, smart technology and eco-sustainability. is a writer, publisher and urban historian. His latest book is Cities Are Good for You: The Genius of the Metropolis (2013). He lives in London.